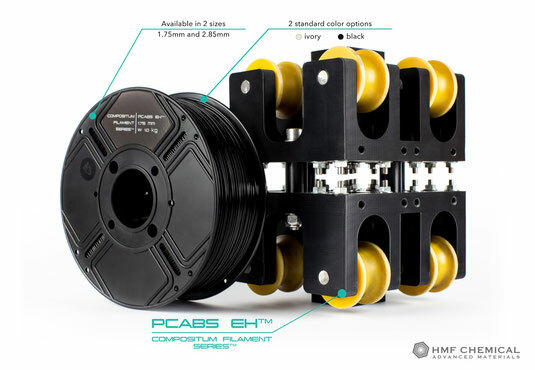 Compositum PCABS EH™ - PCABS materials are dedicated for industry and professional application in open and close chamber FDM 3D printers. It is the most durable material from the group of styrene-based material available in the Compositum™ series. Due to the excellent coherence of the layers, PCABS EH™ is perfect for printing large and complex models without having closed or heated chamber. Models made of PCABS EH™ filaments are very well machined and the strength of the internal threads is comparable to that of aluminum. Because of its very good self-lubricating properties, this material is ideal for prototypes and production of the sliding elements. PCABS EH™ provides a perfect lateral surface without any cracks. It has a significantly increased thermal resistance so that the prints do not deform and can work continuously at temperatures up to 105°C. The linear contraction determined on open printers does not exceed 0.5%. 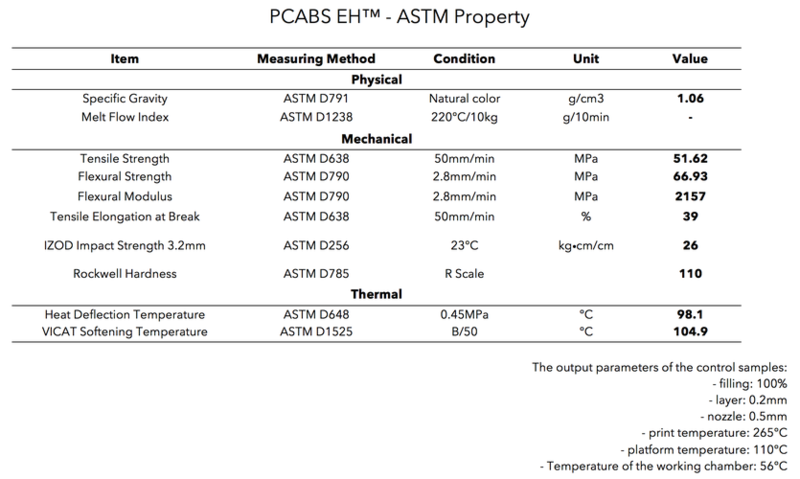 The PCABS EH™ filament, as well as the entire Compositum filament family is characterized by a low emissions of volatiles and very low absorption of moisture, thanks to that the moisture absorbing substance is no required. Very heavily mechanically loaded components, parts of process lines, machines and devices, models requiring further machining and mechanical treatment - cutting, grinding, threading, models requiring operating temperatures above 100°C.